Please note, you will only receive the item selected in the dropdown menu above. If an option is not present then the item is not currently available. The control type can be changed inside the receiver by moving the jumper to pin 2&3 (toggle), 1&2 (momentary) or 1 pin (latch). These units can be used for starting and stopping, or the connection and break of devices and electrical machinery. The product could also achieve the requirements of various kinds of special control procedures. Each device connected will need to be powered by it's own power source (there is no voltage output from the switch, it only acts as a connecter/disconnecter for an existing live circuit). 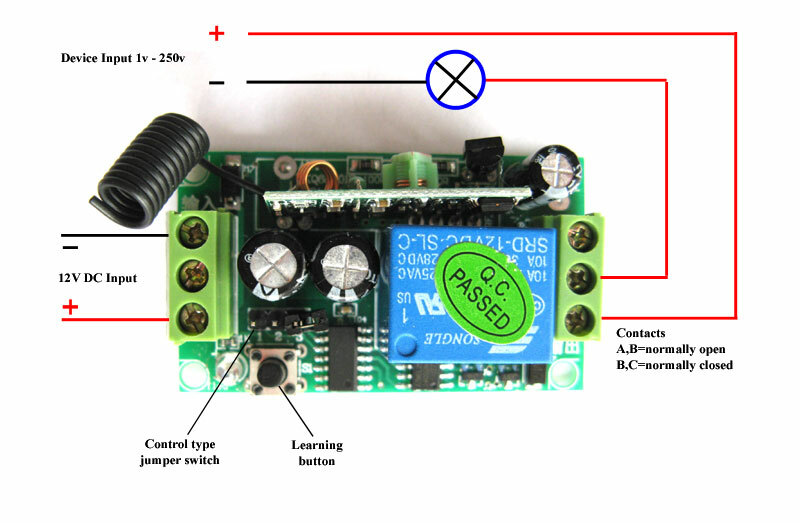 If using a 12v device it can be wired in parallel with the switch power supply.